toilet, they both work together to reach new heights. nearest competitor, not only making it easier for each flush to remove an amazing 1,000 grams of waste down the drain, but making the bowl easier to clean and resistant to bacteria. You’ll love how it looks and performs—even the decorative metal trip lever is more durable and attractive. Regardless of which of the four configurations you choose to perfectly match your bathroom’s decor, you’ll be covered with a limited lifetime warranty on vitreous china and a 5-year limited warranty on tank trim. The large 3″ flush valve provides big flushing power to force out more waste. The highly-engineered PuraClean™ glaze finish is 48% smoother(3) than the nearest competitor, making the bowl easy to clean and bacteria resistant. A smoother surface means there are fewer pits where soil can collect, and what does collect wipes away with ease. Durable and attractive, the new decorative metal trip lever enhances the Summit’s universal styling and blends well with any decor. Choose the perfect shape (round or elongated) and the perfect height (standard or SmartHeight™) that’s best for you. 1) Maximum Performance (MaP) testing is an independent testing protocol developed by public utilities to rate toilet efficiency and flush performance in the removal of solid waste. MaP grades toilet performance on a scale of 0 – 1,000. 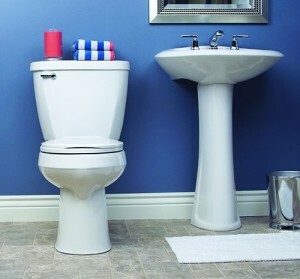 2) Single flush models only; there is a one-year warranty on Dual Flush model tank trim.